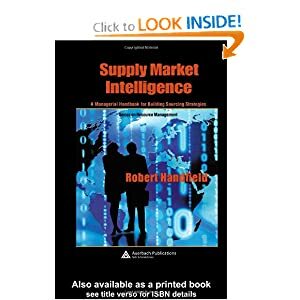 This book is a BIBLE on strategic supply management, going well beyond strategic sourcing and supporting it with the knowledge, data gathering and how to deal with the environment to make it successful. In fact, the subtitle of the book is: a managerial handbook for building sourcing strategies. The author is a guru and a good friend of mine, Dr. Robert Handfield, supply chain MBA professor at North Carolina State University. Excerpt from the book:"A critical need that is lacking in many organizations’ competitive tool set today: the need for better decision making and strategy execution in the supply management function." "....many companies focused their attention on strategic sourcing, which in many cases involves simply reducing one’s supply base, squeezing cost reductions out of suppliers through intense negotiations (or even worse, through reverse auctions), signing a contract, and leaving an internal customer to manage an already strained relationship with the selected supplier." "Although cost reduction may be achieved, this approach to strategic sourcing has several limitations. First, this method is a one-time “hit” rather than a planned endeavor to leverage spending opportunities from diverse business units (especially prevalent after a merger). Second, the savings may not continue and, in fact, may discourage a supplier from offering additional improvements in quality, technology, or cost savings in the future. As one executive noted, “The greatest savings take place after the ink has dried, but it requires a collaborative approach to savings, and a whole different set of processes.” Third, the strategic sourcing process described in the preceding text often takes place in a vacuum, without a thorough assessment of internal customer requirements, changes in the business environment, and events or changes in the supply market." This handbook takes a holistic approach and provide step by step guidance in implementing strategic sourcing and supply management. See it for yourself. Take a look at the table of contents at the Amazon link, and you'll agree with me. it looks like a very interesting book referring to the introduction.Also it is really expensive.